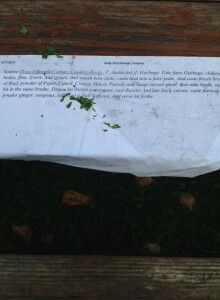 “Garbage” is a 15th century recipe for a thickened broth made of…well, garbage. Why? 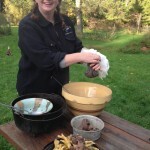 It was the annual chicken harvest at the Packards’ house. A few SCA and non SCA folk gather and harvest the chickens raised over the summer. This year there were 49 chickens. 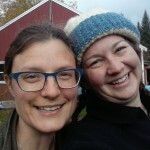 Last week Anya and I made chicken foot stew loosely inspired by the Garbage recipe to make a potluck dish at the Endewearde Hunt. 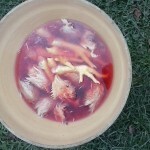 We used last year’s frozen chicken feet. 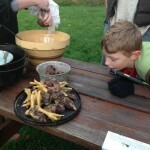 But – behold – it was chicken killing day! There were all KINDS of chickens and ample “garbage” about so we decided to make the recipe today with all the fresh garbage we had. Garbage. Take faire Garbage, chikenes hedes, ffete, lyvers, And gysers, and wassh hem clene; caste hem into a faire potte, And caste fressh broth of Beef, powder of Peper, Canell, Clowes, Maces, Parcely and Sauge myced small; then take brede, stepe hit in the same brothe, Drawe hit thorgh a streynour, cast thereto, And lete boyle ynowe; caste there-to pouder ginger, vergeous, salt, And a litull Safferon, And serve hit forthe. It’s from “A composite and miscellaneous volume put together by John Crophill (d. in or after 1485), medical practitioner and bailiff of Wix Priory in Essex.” This is the original manuscript. I first encountered it on Daniel Meyer’s website, medievalcookery.com. We cooked based on the above recipe, and redacted it as we cooked. We didn’t formalize it, but this is what it was. 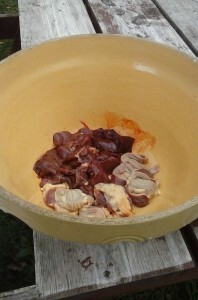 I carefully cleaned the livers and gizzards and feet. I then plucked the heads as much as I could be motivated to (I figured that medieval people may have also been lazy!) and cleaned them as well. It began to rain heavily, so I fled for a while, and when I returned there was rainwater in the bottom of the cast iron pot hanging over the fire. 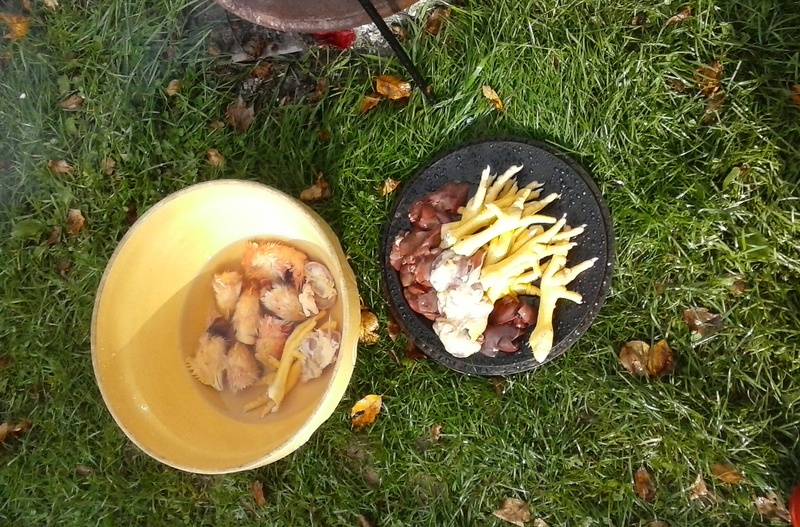 I added to that steaming water livers and gizzards and feet. Anya brought out the broth and added it. 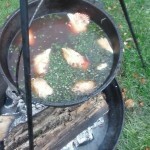 When the broth was in, I added the heads and herbs, except the ginger. Put the lid on. 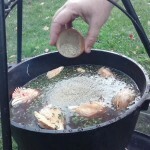 Let it boil. After it had boiled, I added the ginger to it and stirred. 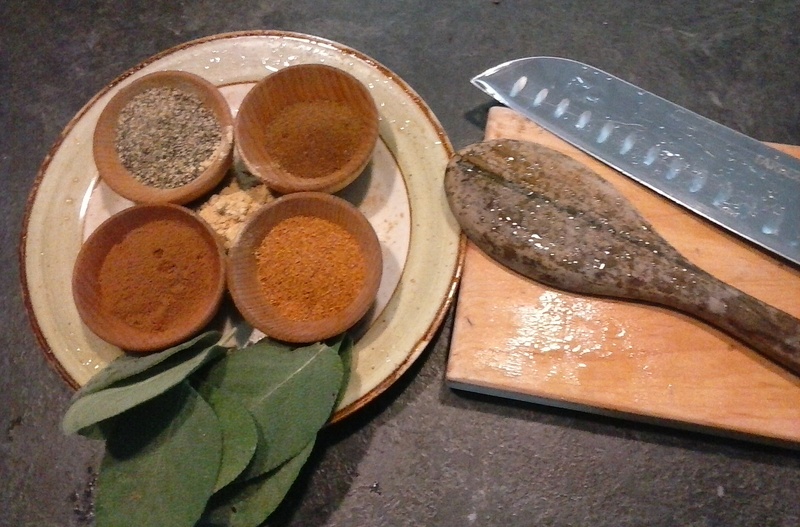 We decided to hold on the bread and that the saffron was likely for color, but we didn’t have any anyway. It looked horrible but smelled ok. Put it back on the fire and let it heat up again. 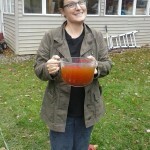 Anya brings the beef broth. Adding pepper to the pot. 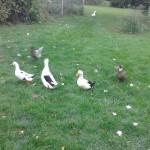 The ducks, morbid things, kept coming over to check things out. Another hour later or so we checked on it. It looked a lot like it had been appropriately named. Here we decided to deviate from the recipe. I removed all the parts, separating the livers, which we used to make a pate with butter and onions. 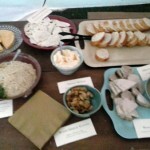 The “garbage pate” was well received and many ate it on toast and praised its rich taste. Ultimately we just dipped bread into the soup and ate the bread. We then canned all the remaining broth. The assessment was that it looked horrible but it was very tasty. 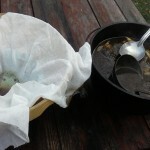 It made sense to not waste things that could make a good and fatty broth, which we did and which made for little waste. It was especially good on a day when we were deeply in touch with our older time agricultural heritage – killing and gutting and plucking by hand made the process seem ancient and rooted. 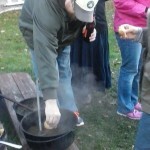 Gathered around a fire, sharing a spoon of broth, tearing off large pieces of bread and dipping them into soup or putting thick smears of pate on them, felt like an old, old fellowship. There was a lot of stuff to strain. Anya does not like the heads. Anya mashes the buttery onions for the pate. Anya and Aneleda smile at Garbage well-cooked. I’m glad we made the Garbage. It was fun, entertaining, thrifty, and tasty. We have put some away for leaner times (or feasts) and that felt right too. 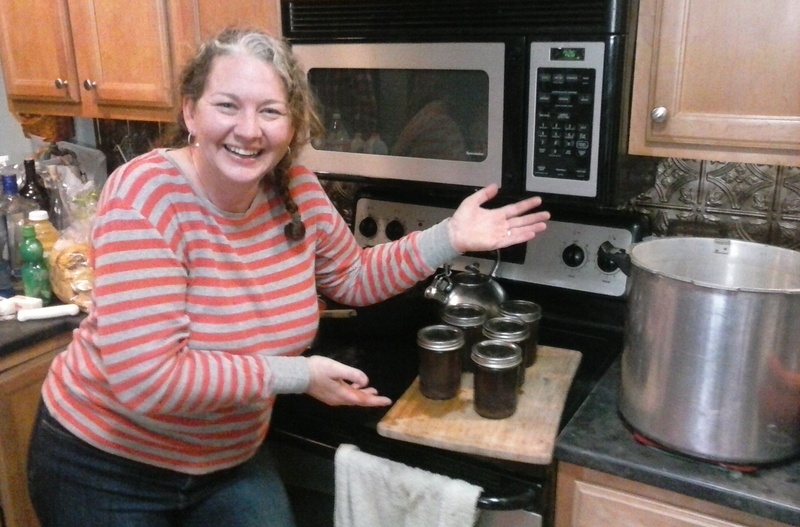 Anya canned the remaining Garbage, of which we now have five pints! Eating, singing, laughing – this is the stuff of a good life. I call this experimental archeology project a smashing success! It started as a lesson in waste-not-want-not. 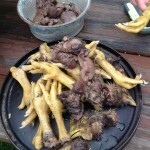 Lady Anya (Jill Packard) had some chicken feet. She’d cleaned them and frozen them after the chicken harvest the year before, when she and her husband Lord Oleksander invited us to join in the annual harvest. Over a dozen of us slaughtered, plucked, and cleaned more than 50 chickens that day. I’d held those feet while I pulled feathers from many of those birds. 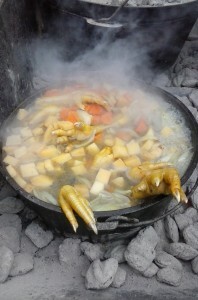 We decided that we should make some soup or stew with the feet, because they are reported to make wonderful broth. We figured that medieval people would have used as much of everything that they could, because it takes a lot of work to raise and harvest creatures to eat. Feet would be no exception. 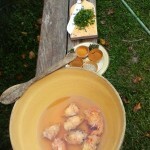 Daniel Meyers had the recipe on his website which included three versions of the original recipes. We used this as inspiration. He had his own redaction but we were making our own recipe as we had slightly different ingredients and plans. Source [Two Fifteenth-Century Cookery-Books, T. Austin (ed. )]: Garbage. 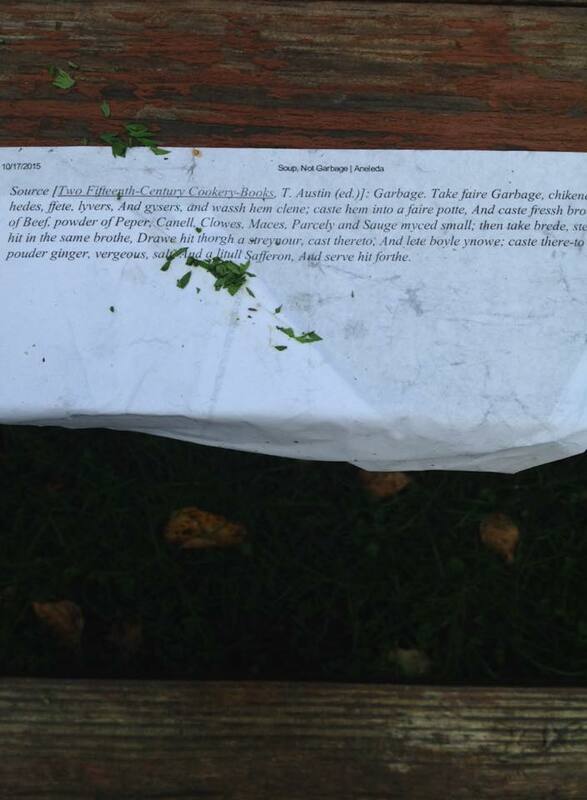 Take faire Garbage, chikenes hedes, ffete, lyvers, And gysers, and wassh hem clene; caste hem into a faire potte, And caste fressh broth of Beef, powder of Peper, Canell, Clowes, Maces, Parcely and Sauge myced small; then take brede, stepe hit in the same brothe, Drawe hit thorgh a streynour, cast thereto, And lete boyle ynowe; caste there-to pouder ginger, vergeous, salt, And a litull Safferon, And serve hit forthe. Source [A Noble Boke off Cookry (Holkham MSS 674), R. Napier (ed. )]: To mak a garbaggysowrys; washe hem clene, an caste hem in a fayre potte, an caste ther-to freysshe brothe of Beef or ellys of moton, an let it boyle; an a-lye it wyth brede, an ley on Pepir an Safroun, Maces, Clowys, an a lytil verious an salt, an serue forth in the maner as a Sewe.e tak the heed the garbage the leuer the gessern the wings and the feet and wesche them and clene them and put them in a pot and cast ther to brothe of beef poudere of pepper clowes maces parsly saige mynced then step bred in the sam brothe and cast it to pouder of guingere venygar saffron and salt and serue it. We will never be allowed to be food stylists, ever. 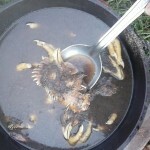 We also knew that the Jamacians use them for soup even now. And that they’re considered good eating in many Asian cultures. It’s recognized that they bring extra good things to a soup, health-wise, and one cook thought that they would even help make joints feel better – especially with a little vinegar added to help bring calcium from the bones. Medieval veggies are often made into thick stews called pottage. Broad beans are common, so we used lima beans. Carrots are less common (and would have been purplish!) and turnip seemed to usually have more going on with it (cheese!) and onions were…largely unmentioned in many pottages. 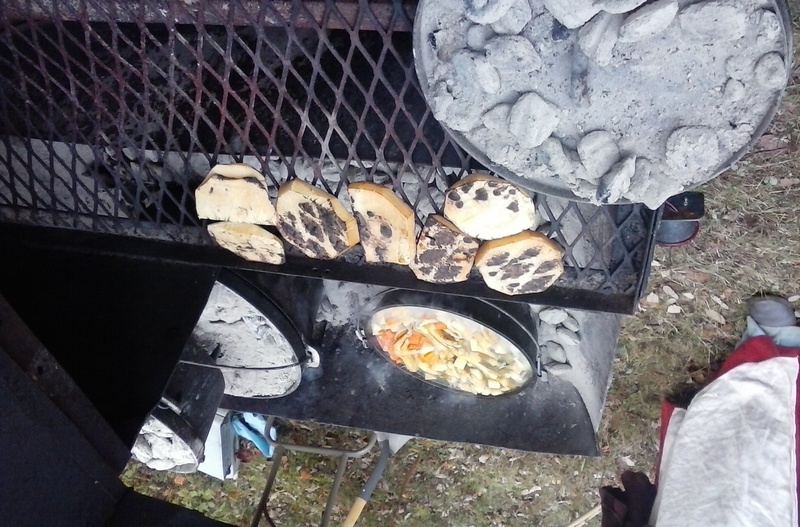 But we wanted to do this our way and we chose to add veggies. We decided not to add the bread, in the end. 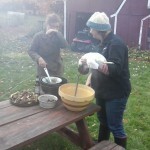 At the Endewearde Hunt, which is in October in Maine, soup is a good thing. 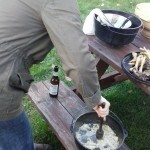 It’s also good for a crowd and easy to cook outdoors. 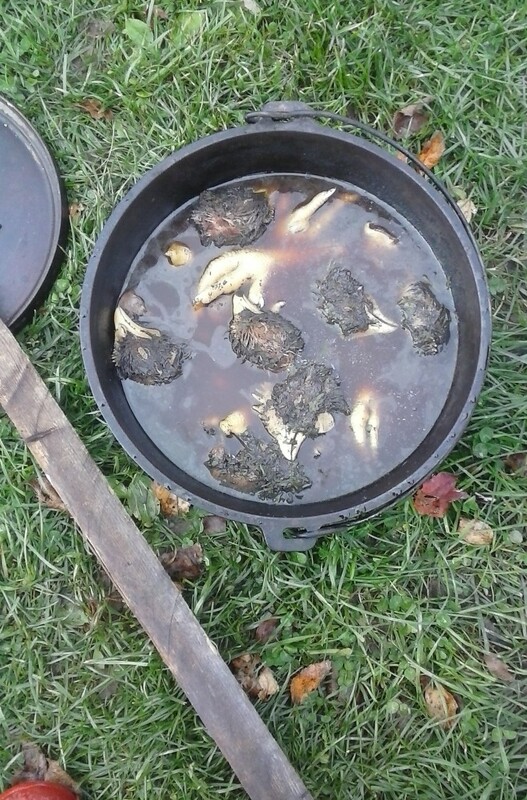 In a cast iron Dutch oven, we warmed the bones in a little water to get the flavor moving in them. In a larger pot, we added cut onions, carrots, and turnips. 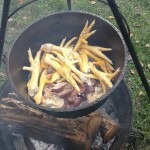 We made velociraptor noises and played with the chicken feet. 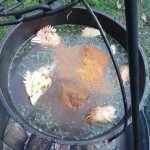 We artfully arranged them in the pot. We took photos. When we had finally had enough of that, we added the spices. 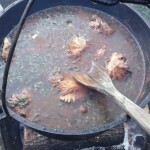 We splashed in some vinegar then we poured the marrow bone drippings from the second Dutch oven and added one of the bones to the mix. 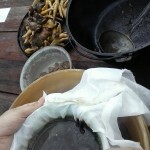 We put it on hot coals and put coals on the top of the lid. Then we let it do its thing. 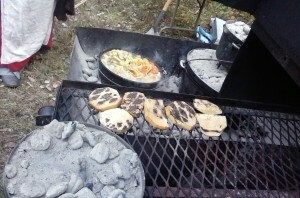 It cooked on very hot coals for a couple of hours. When finally served, it had lost some vibrancy and much liquid, but was a really pottage-y pot of melt-in-mouth soft vegetables. 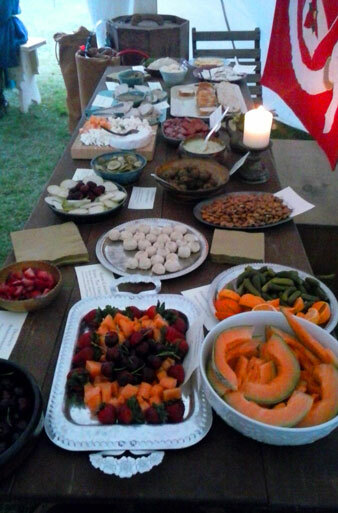 Overall though, we were delightedly surprised that people were so comfortable with eating something so “weird” and unusual on even an SCA table. We’re thinking of how we can do it again with a better recipe. And in spite of my dislike of liver, we may even try to make Garbage on the next go! A very dear friend and Thanet house-brother, Ane du Vey, was to be elevated to the Order of the Chivalry at the Great Northeastern War in Malagentia in mid-July, 2015. 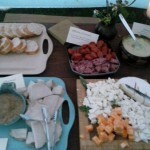 I was invited to create the vigil menu to share hospitality with visitors who were coming to visit Vey as he sat vigil. It was important to me that the food be period-possible for the most part, with influences of period spices and simple foods. Vey prefers simple things like roast meat, so I created things I knew he would enjoy. 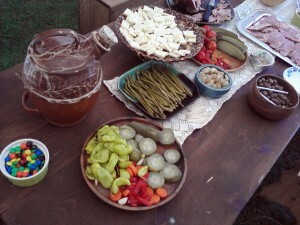 Also, because there would be many coming who had been fighting during the day, I included some loving nods to a field dayboard incorporating gatorade, oranges, pickles, and pepperoni – all items which are regularly eaten field-side between battles. I prepared the majority of the food, since I can do food, but I can’t sew, and that’s what everyone else was doing to get ready. The day of the event, Lady Thallos of Brighton Hall, Lady Agatha Wanderer, Lady Lucie Lovegood, m’Lady Alesone and her lord Absolon of the Debatable Lands, and other members of Thanet House assisted with the plating and setup. Lucie and Lord Alaric did a number on the dish cleaning in the morning. This is the menu for that event. We believe that about 200 people visited the camp and we served food from roughly 5pm through 2am. 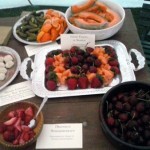 Fresh Fruit in Season -Strawberries, Cantaloupe, Cherries, and Pears. I tried to choose fruits that would have been available in period, having been in fashion in 14th c. Italy, brought by the Arabs in southern Spain. Strawberries in Elderflower Liquor. A little bit of beautiful, floral liquor helps keep the strawberries in good shape and tastes and smells amazing. Fighter’s Tray. Sliced oranges and small dill pickles. Since it’s the food most often eaten by fighters, I included it on the menu as a nod to the regular fighter’s dayboard. Almonds – raw, plain almonds. Almonds were popular in the middle ages, as now. They are good protein and easy to eat without mess. Roast Pork Loin – pork loin roasted with lemon, pepper, salt, and garlic served with large-grain, homemade mustard. Beer & Mead – There were several varieties of beer provided by brewers in the Barony of Endewearde. 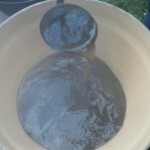 Mistress Sylvia du Vey provided mead. 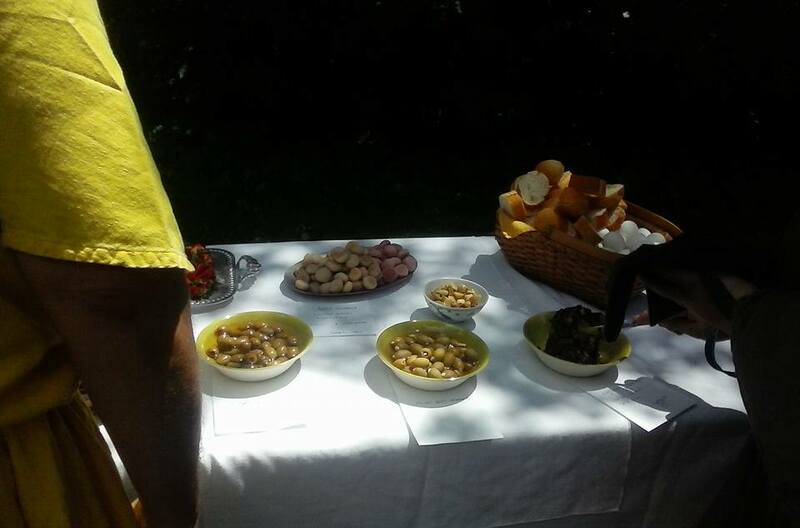 Also part of the spread were some food gifts – a loaf of homemade bread, and some of Lady Rose’s amazing salsa served with corn chips – also some of Vey’s favorite things. 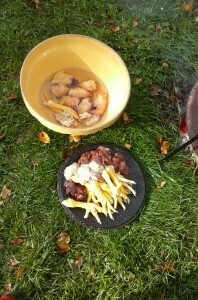 We repeated the menu, mostly, for a dual party for Sir Vey and Sir Ed McGuyver on Saturday night. 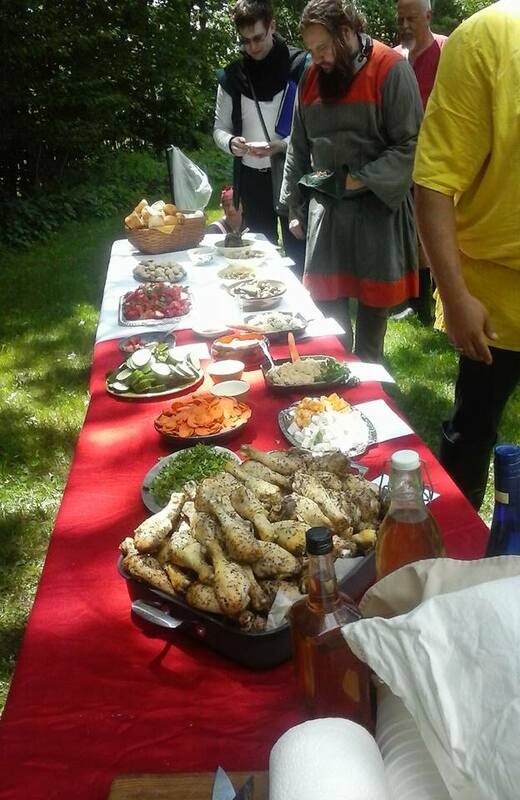 Anything we had not placed out the night before was plated and sent, augmented by breads, spreads, salsas, chips, many cookies, and much beer and mead. I know that Lady Rose had a large hand in those provisions. In addition to the help from the night before, my husband Andre helped, as did Sir Cedric of Amorica and – at the end of the night when the candles had burned low – Sir Matthew Moraveous stayed to assist with cleanup of the main tent. The next morning when I finally rose, I found Sir Vey himself washing the dishes. Many were fed. It feels like loaves and fishes at Thanet sometimes. I wanted to explore some items in Middle Eastern cooking. 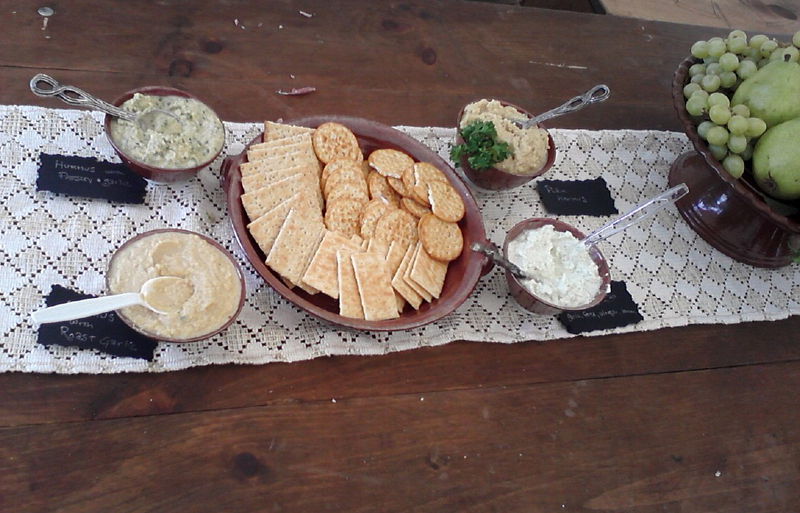 I also wanted food that would not be too far outside people’s comfort zone, and I wished to fulfill the suggestion of our Baron and Baroness that the dayboard ought to be, ideally, finger food. 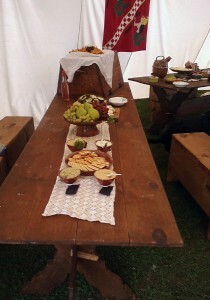 The dayboard was prepared to serve 100 people a light repast. About 70 attended the event and ate, I think, very well. The budget was $150. Chicken was purchased at $.79/lb. Eggs and cheese have increased in price a great deal recently. 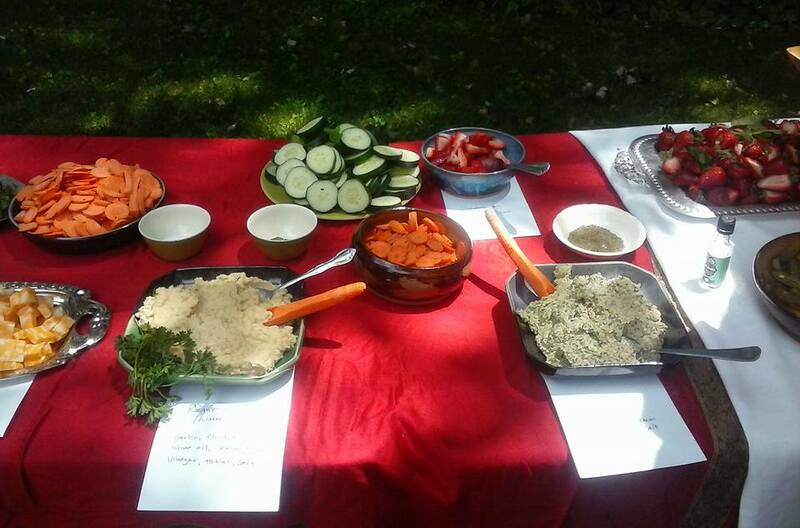 The meal was pretty close to budget – I donated some small things (some flour, sugar and butter and all the spices.) 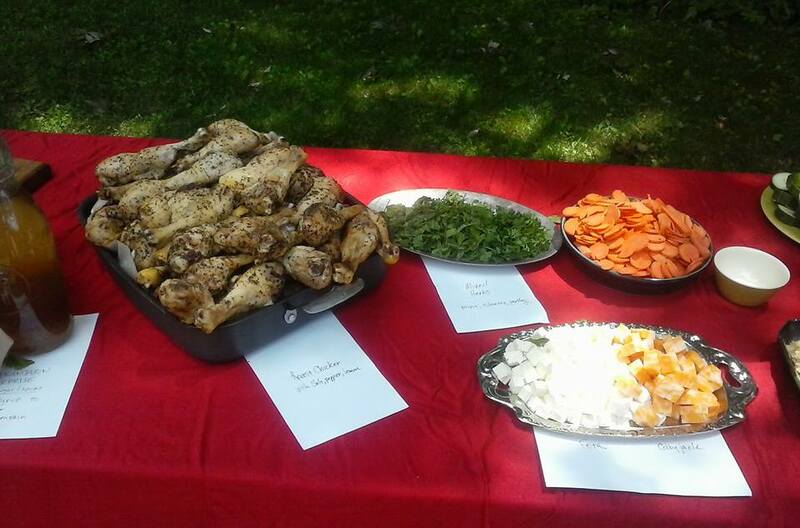 As the day was quite warm it turned out to be a really lovely meal of crisp veggies and the chicken, which I planned to heat on the grill, but the assembly (who had gathered to watch the laying of the table) thought cold would be just fine. 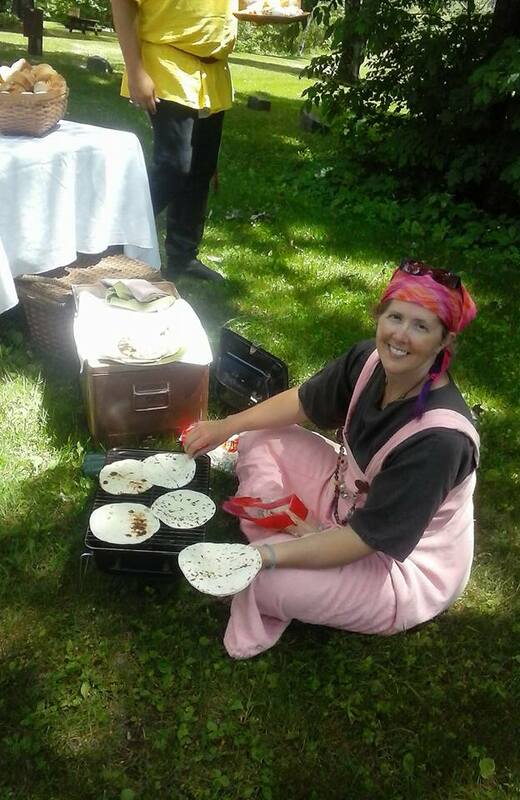 Including His Excellency the Baron, so cold it was.I had help from Agatha Rachel Case in cutting and laying out things and help from Alys Karen Childs who chopped cheese and then grilled all the flatbreads. It was a merry work crew and I appreciated their help very much. – ‘Adjari: The Virgins (“adult butter cookies” so named because you are to make the dough and then “form like the breasts of the virgins” and bake them.) Regular and flavored with rosewater. – Badhinjan: Tangy Eggplant Stir Fry (eggplant, chopped walnuts, oil, vinegar, onion, caraway, garlic) This was the surprise favorite of the day, to my surprise. It was my “risky new thing” dish. 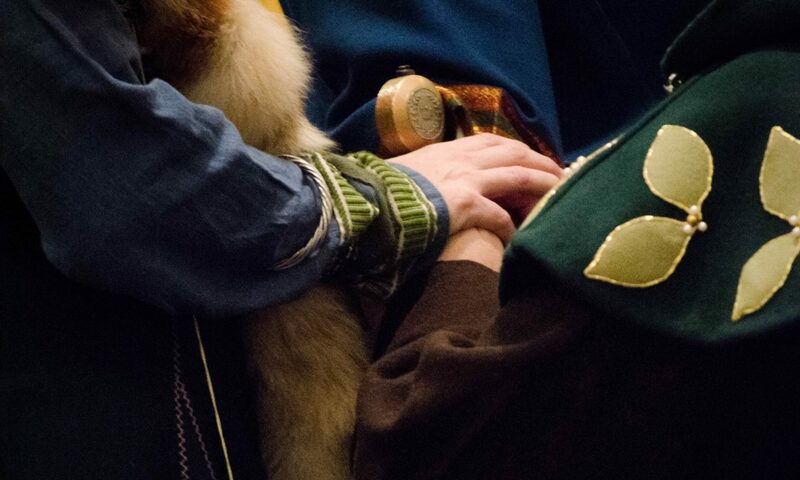 My dear friend and fellow Lady of Thanet, Sylvia du Vey, was sent on Vigil to consider her answer to the Crown on the matter of her induction into the Order of the Laurel at the Great Northeastern War. While there are many parts to a vigil, for those who wait to speak to the person on vigil, hospitality is essential. On a hot summer day doubly so. 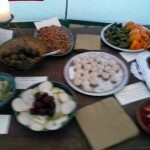 This is the vigil hospitality we prepared for Sylvia’s vigil. 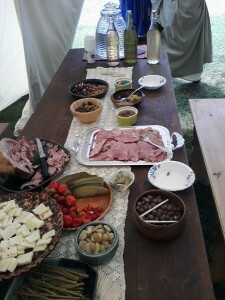 Due to the heat it seemed fitting to go with foods that were cooling or light, pickled and salty things were important too, as was an ample supply of hydrating beverage. Because we knew the large community tent would be busy all day, we also spread mint leaves across the whole of the floor so when people walked in and out there was a pleasant scent. 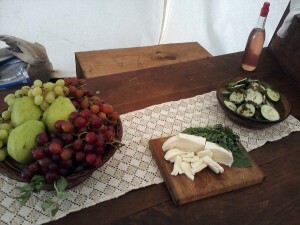 Food was refreshed during the day, and different foods were added an the day progressed. By the middle of the afternoon, both tables were heavily and beautifully laden with foodstuffs. The people who helped to make or purchase the vigil food were myself, Lady Agnes Wanderer (Rachel Case), Lady Lucie Lovegood (Erin Neuhart LeBlanc), Lady Thallos of Brighton Manor (Bridgette Paulus) with help from Tyrson (Scott Potter) and Cali Paulus, Mistress Bess Darnley (Sarah Patterson), Lord Griffith Abernathy (Griff Kellogg and his lady wife Francie Kellogg), Lord Alexander of Hadrian’s Keep (Matt Blazek), and Mistress Mira of Thanet (Julie Eason).